What It’s About: Operation Market Garden, was a huge combined airborne and ground operation devised by General Montgomery during the Second World War. It was one of those grand strategic strokes that seem to exist merely to fail. Three airborne divisions parachuted far behind enemy lines. Their objective: to seize vital bridges that would allow the ground forces to push through to Germany. Why Watch it Today? : Allied forces withdrew from Arnhem today in 1944. The British forces at Arnhem were those dropped furthest into enemy territory, became isolated and were forced to hold out without supplies for days, a heroic if ultimately futile defense. 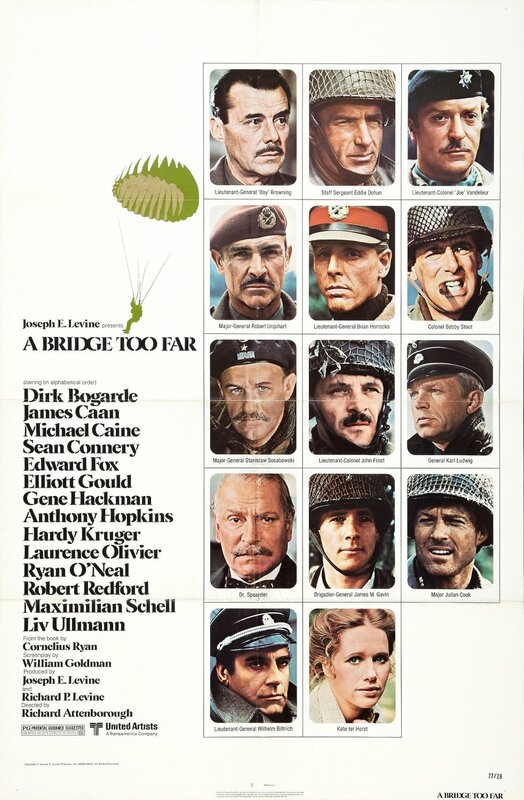 A Bridge Too Far tries to tell a bit too much story with a too-star-studded cast, but at its best moments (generally involving Anthony Hopkins and his men within Arnhem) it is a stirring, if heartbreaking, film. This entry was posted in "Based on a True Story", Adaptation, Airborne Operations, Based on a Book, Campaign History, Epic, Event Film, Independent, Movie of the Day, Period Film, Special Operations, War Movies and tagged "A Galaxy of Stars", "Cast of Thousands", Anthony Hopkins, Arnhem, Ben Cross, Cornelius Ryan, Denholm Elliott, Dirk Bogarde, Edward Fox, Elliott Gould, Gene Hackman, Hardy Kruger, James Caan, John Ratzenberger, Laurence Olivier, Liv Ullmann, Maximilian Schell, Michael Caine, Nazis, Operation Market Garden, paratroopers, Richard Attenborough, Robert Redford, Ryan O'Neal, Sean Connery, United Artists, William Goldman, World War Two. producer joseph levine, as even a booklet in a dvd states, got the millions for this movie upfront, from theater owners—-and made a couple millions in profit even before the cameras rolled! that is, levine sold more than 100 percent of the movie to theater owners? just a coincidence that levine released mel brooks’ THE PRODUCERS? !